Creating new dishes to keep up with diners’ demand for salted egg flavour is challenging. 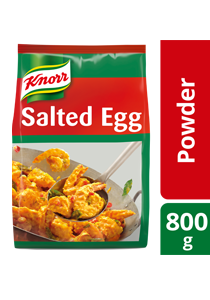 Knorr Golden Salted Egg is a versatile ingredient for creating endless innovative salted egg dishes. *25% lower in sodium as compared to regular recipe mixes. 1. Heat up 50g of Planta Margarine. 2. Add in curry leaf and chilli. 3. Add in 35g of Golden Salted Egg Powder and stir over low heat. 4. Add in fried prawn and toss evenly. Store in a cool and dry aplce. After opening, fold the bag, seal propoerly and keep refrigerated at 4-10°C.